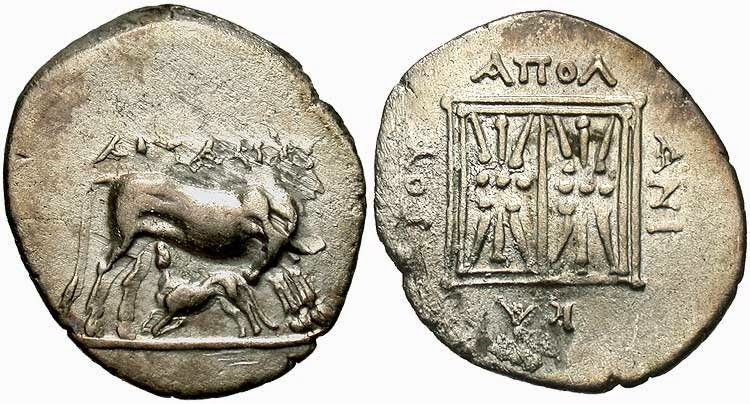 Apolonia which lived for 11 centuries between 620 BC and 479 was a city-state that originated as a product of the process of “Great ‘Greek colonization” VIII-VI centuries BC, on the shores of Illyria, which were populated by the community of Taulantia tribal. 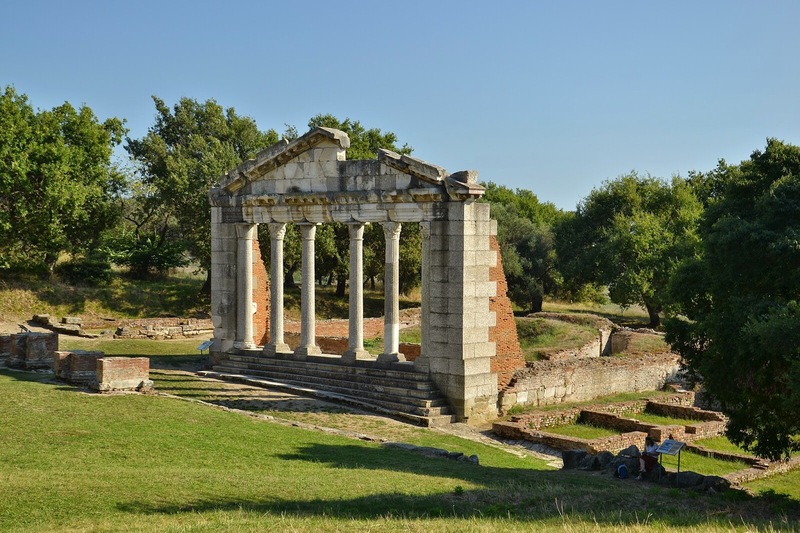 Stefan Bizantini, one of ancient authors say that: ”it was the largest city and most important of the 30-to colonies that were established across the Mediterranean with the name of god Apollo”. Apollonia was founded in 588 B.C. jointly by the Greek settlers from Corinth and Kerkyra (today Corfu), N.B. colonised by Corinthians in about 8th century B.C.1 The settlers were led by a man called Gylax and it was his name after which the city was given its first name was Gylakea in honor of its founder Gylak of Corinth. Later, the name was changed to honour the god Apollo. Thirty other cities in Macedonia, Thrace, Crete or Italia honoured the god in the similar way2. 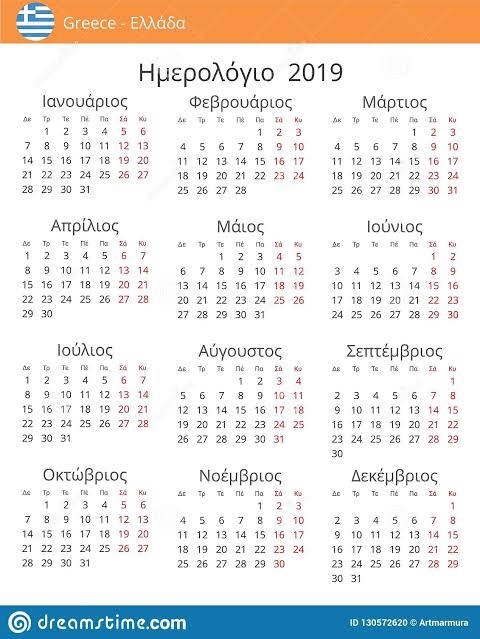 For a change, we also have Aπολλωνία κατ’ Επίδαμνον, i.e. Apollonia near Epidamnos – the city which was founded a bit earlier, in 627 B.C., also by the settlers from Corinth and Kerkyra. 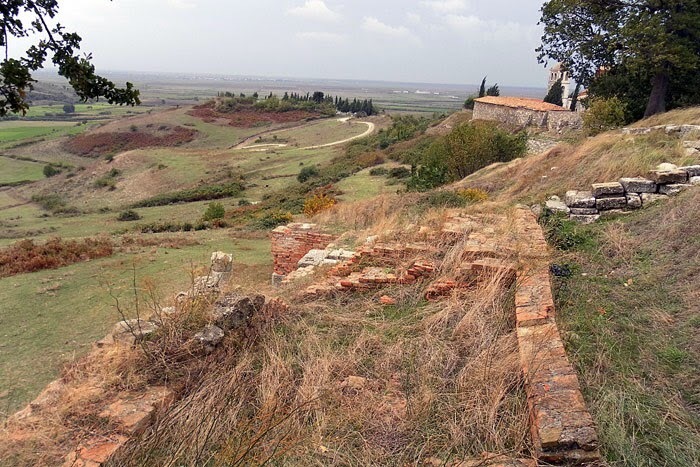 These days, the ruins of the city lie in Albania, close to Pojani village, 7 km from Fier. The settlers founded the city in a very convenient location. Apollonia was built on a gentle hill over the Aoos River (Αώος), just a few kilometres from the sea. When it comes to the trade, the new Corinthian colony was perfectly located and, what is more, it was situated on very fertile soil, so it is not surprising that soon it became one of the richest harbours of the Adriatic Sea. It is mentioned by Strabo in his Geographica as “an exceedingly well-governed city”. Aristotle considered Apollonia an important example of an oligarchic system, as the descendants of the Greek colonists controlled the city and prevailed over a large serf population of mostly Illyrian origin. The city grew rich on the slave trade and local agriculture, as well as its large harbour, said to have been able to hold a hundred ships at a time. The city also benefited from the local supply of asphalt which was a valuable commodity in ancient times, for example for caulking ships. The remains of a late sixth-century temple, located just outside the city. At the turn of the 4th and 3rd century B.C., the city was flourishing; ramparts were rebuilt and a new coin was being issued. In 282 B.C. Apollonia was seized by the king of Epirus – Pyrrhus. After his death, the city strengthened its relationships with Rome which stationed its permanent garrison here since 229 B.C. Roman army stayed in the city until 168 B.C. 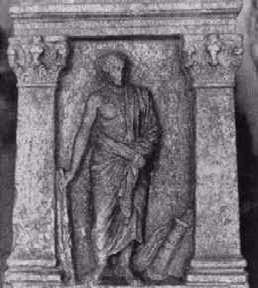 Roman proconsul Gnaeus Egnatius began the construction of a road which inherited its name after its designer, i.e. Via Egnatia (Ἐγνατία Ὁδός) in n 146 B. It led from Dyrrachium through Thessaloniki up to Bizancjum, 746 Roman miles3 in total, i.e. about 1103 km. Apollonia had become the second, after Dyrrachium, western end of this road, which had an impact on the city’s growing importance. 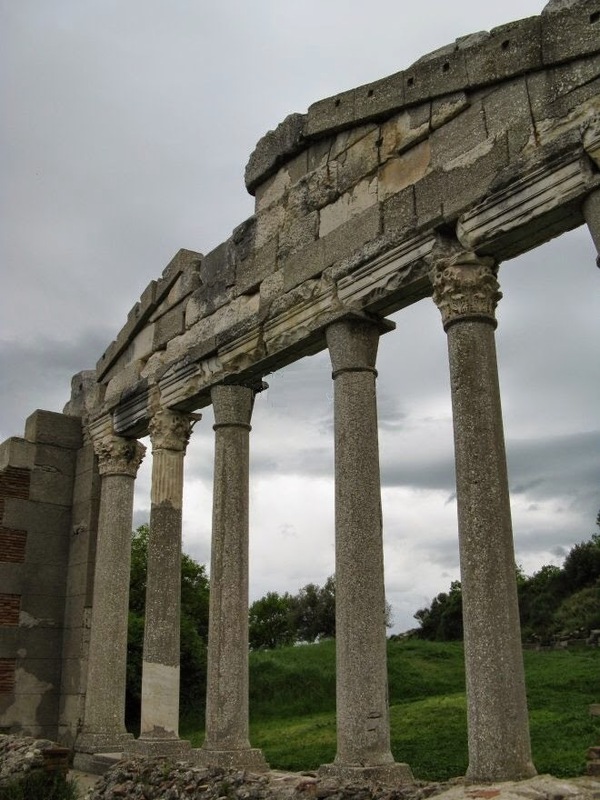 Regrettably, at the beginning of the 3rd century, Apollonia was largely destroyed by a strong earthquake. What is more, due to this earthquake, the bed of the Aoos River (now Vjosës) moved away from the city and the crop fields turned into marsh. The total destruction of the city was sealed by the invasions of people from the north. 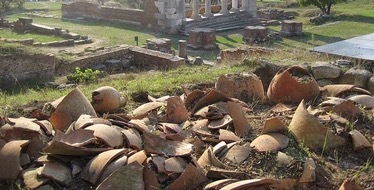 In the end, the city of Apollonia perished. 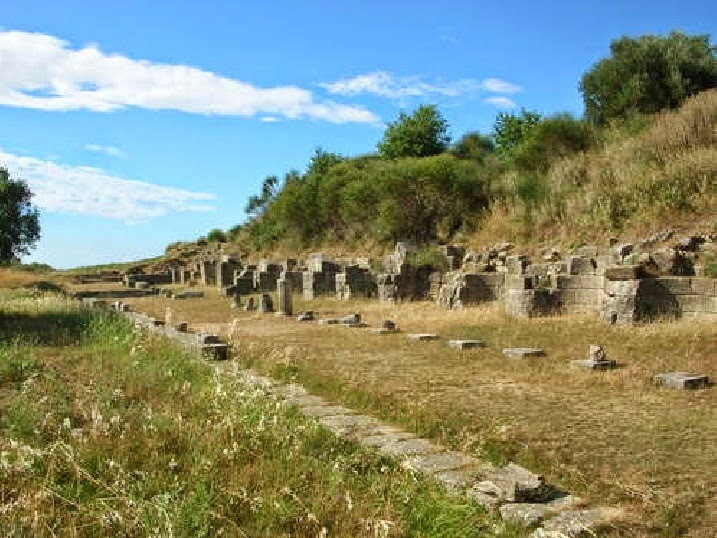 Apollonia represents one of the most important cities of the Mediterranean world and Adriatic basin, preserved in an exceptionally intact condition. Numerous monuments inside its original borders comprise an outstanding evidence of Greco – Roman culture of the city. Strabo has noted that the city was founded by Greek colonists from Corfu and Corinth, who found in its territory an earlier local settlement with its own unique cultural elements. 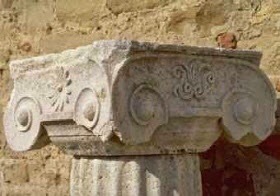 The presence of this local culture is determined by the discovery of archeological artifacts from the Iron Age, tracts from an existing archaic fortification, the temple of Artemis as well as the tumular necropolis near the territory of the ancient city of Apollonia. The coexistence between two different cultures and their inevitable fusion produced a unique physiognomy of apollonian culture, which turned Apollonia to one of the most important economic centers of ancient Mediterranean world. The urban structure of the city lay on the hilly plateau, with an expanded view towards the fertile plain of Musacchia and the Adriatic Sea. The communication with the coast was enabled by the Aoos River, which flowed nearby. 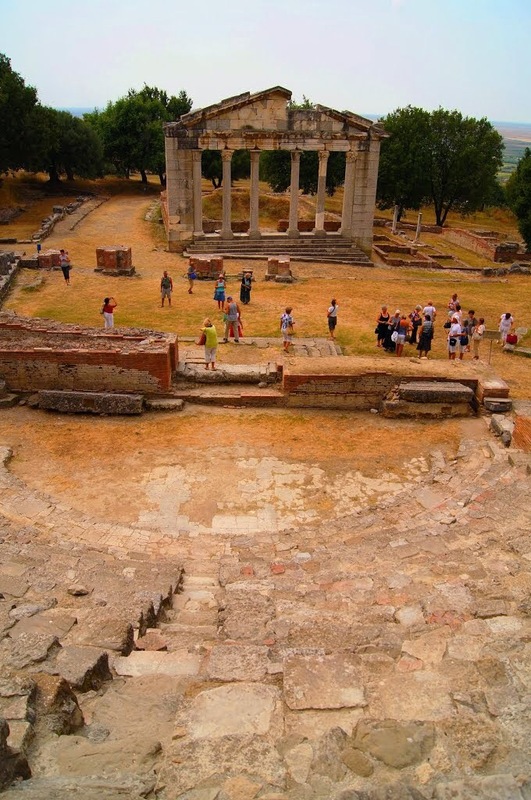 Inside its original borders in the 4th century BC Apollonia raised into one of the most important economic, political and cultural centers beside Epidamnos – Dyrrachion. 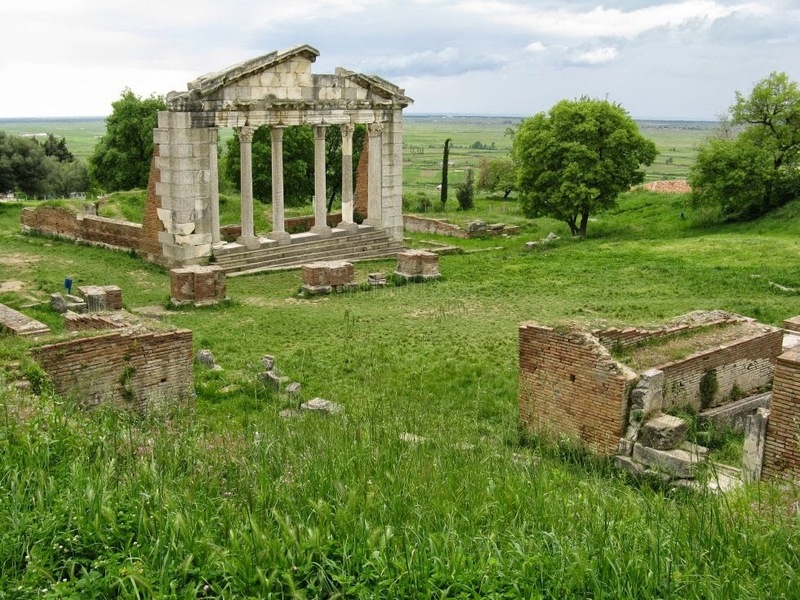 Temenos, or sacred area of the city, has been organized around the Temple of Apollo. In this part of the city, was build a number of monuments dating in the same period (6th century BC) with the temple of Apollo. 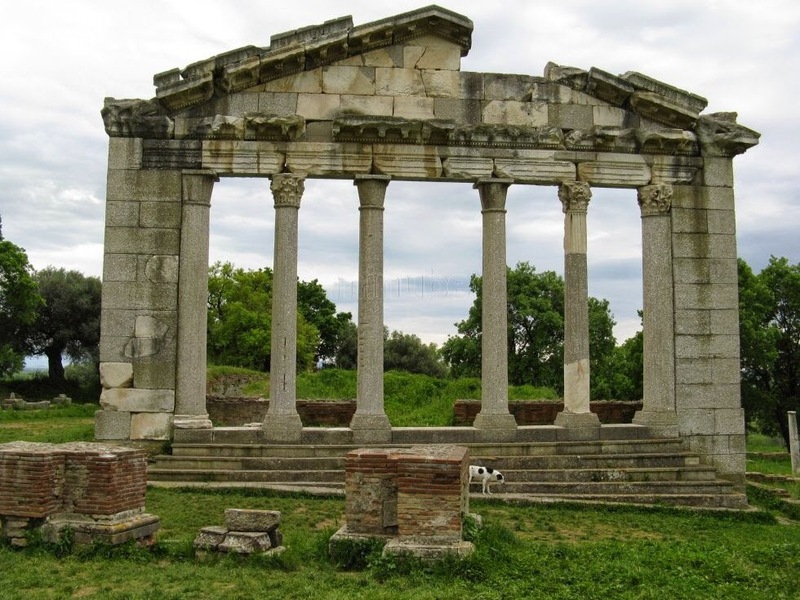 There are preserved traces of a Doric temple with a east – west orientation, storehouses and cisterns (3d century B.C. ), two small sanctuaries, noted by archaeologist as A and B (1st century BC). 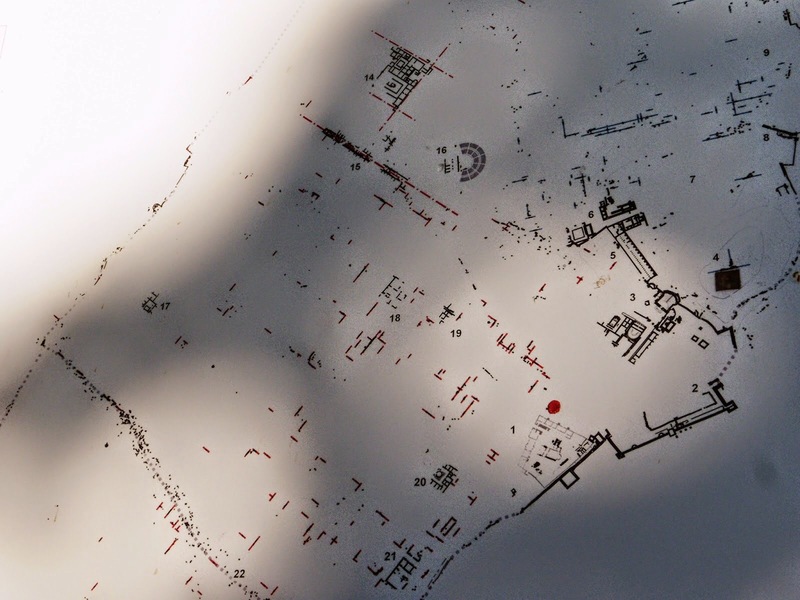 Agora or social space was extended in the area between two hilltops, including the most important monuments discovered in the territory of Apollonia, consisting in different building phases. Their study has contributed to the creation of a complete panorama on the development of the city. 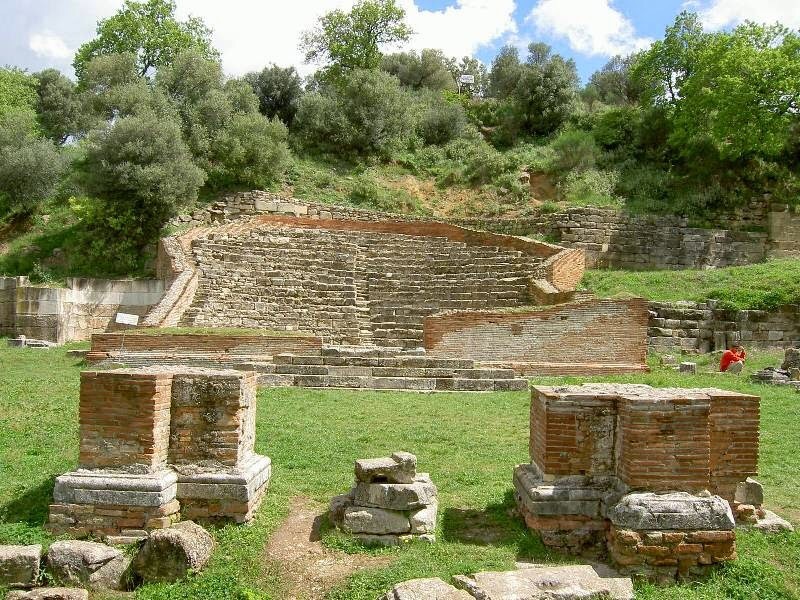 During 4th and 3d centuries BC were added the retaining wallsofthe sacred area of Temenos, two Stoas (walkways or porticos), a Greek theater and a Nymphaeum (a monument consecrated to nymphs). During the Roman period, these area was increased with other social buildings like the Buleterion (the seat of the city council) an imitation of the Roman temple architecture; the Odeon, a combination of Greek and Roman construction techniques; the Library; the Arch of Triumph; the Temple of Diana and Prytaneion (the seat of government). 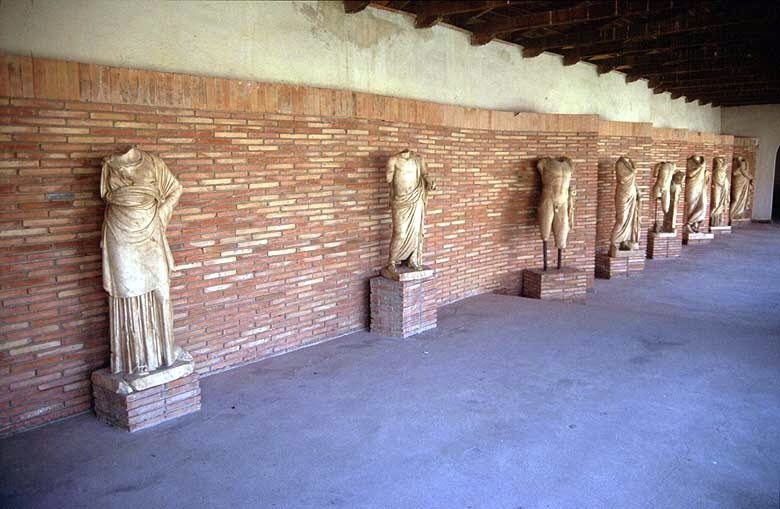 Besides these specific monuments, archaeological excavations in the residential area have discovered a number of buildings from Hellenistic and Roman periods paved with well-preserved mosaics. Different factors, as the earthquake of the year 234 AD which changed the riverbed of Aoos, the failure of the existent social structure and the gothic invasions caused the gradual decline and the loss of the status of Apollonia as a “port city”. The documentary sources of the 4th century AD refer to Apollonia as an important Episcopal residence, which during the 5th century AD was transferred in the neighboring city of Byllis. The successive period of its history remains unknown due to the restricted documentary data. The monastery complex comprises a unique testimony of the later history of the city. 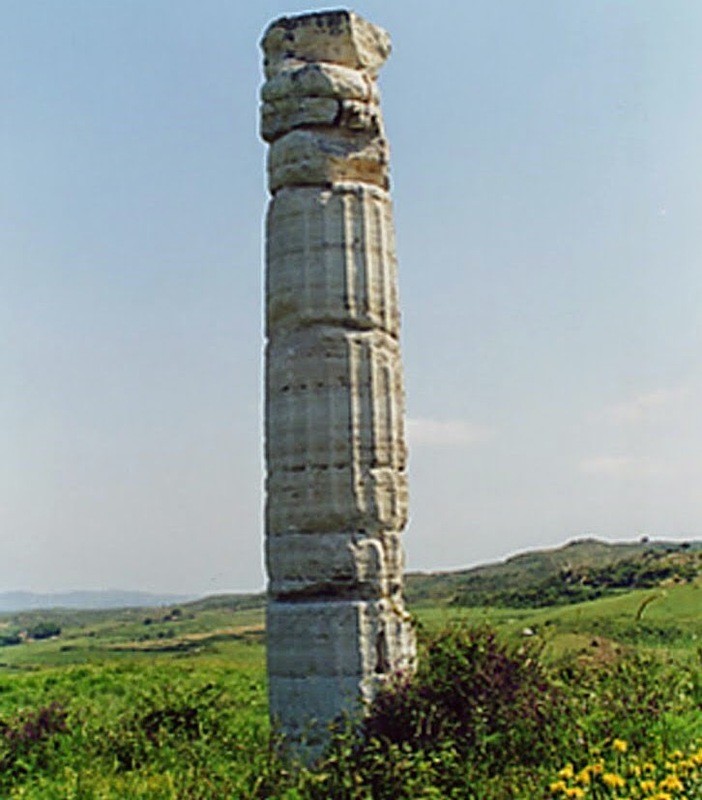 Although the preserved structure of the katholikon has been dated in the 13th century AD, different studies on the subject have argued that it belongs to an earlier date, maybe of 9th century AD. The medieval monastery at Apollonia preserves several structures belonging to different building periods. In addition to the katholikon dedicated to the Virgin (?) or to the Koimesis (?) (Dormition of the Virgin) with its lateral chapel of St. Demetrius, the complex includes the lower portion of a tower, the refectory (trapeza), and, evidently, portions of a building housing the original living quarters for the monks. 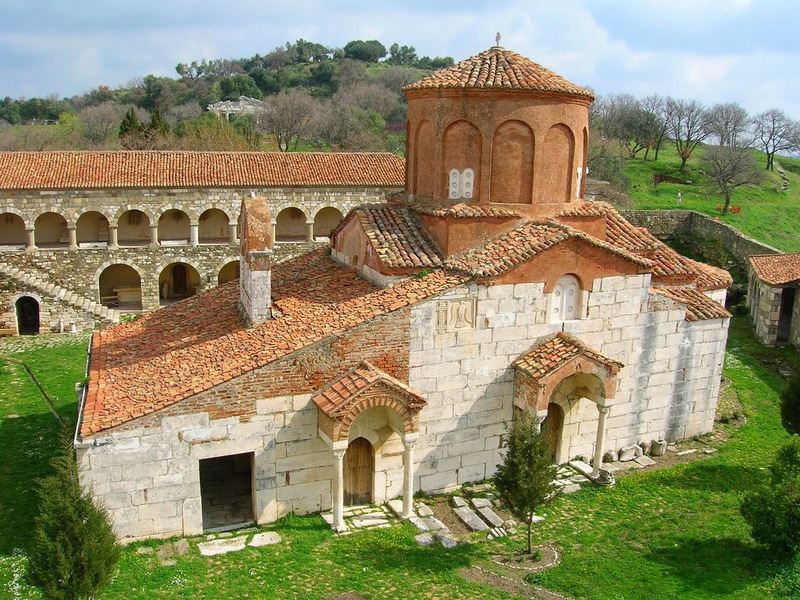 The katholikon of St. Mary dates in the second half of the thirteenth century, and possibly to the reign of Michael VIII Palaiologos, which issued a chrysobull granting the reconfirmation of privileges for the monastery. It belongs to the group of the churches of cross-in-square plan and the links with Constantinopolitan architecture have long been claimed on the basis of its structural system. Despite its irregularities, the whole arrangement of the church planning is simple and clear, with a domed nave, a narthex and an exonarthex. 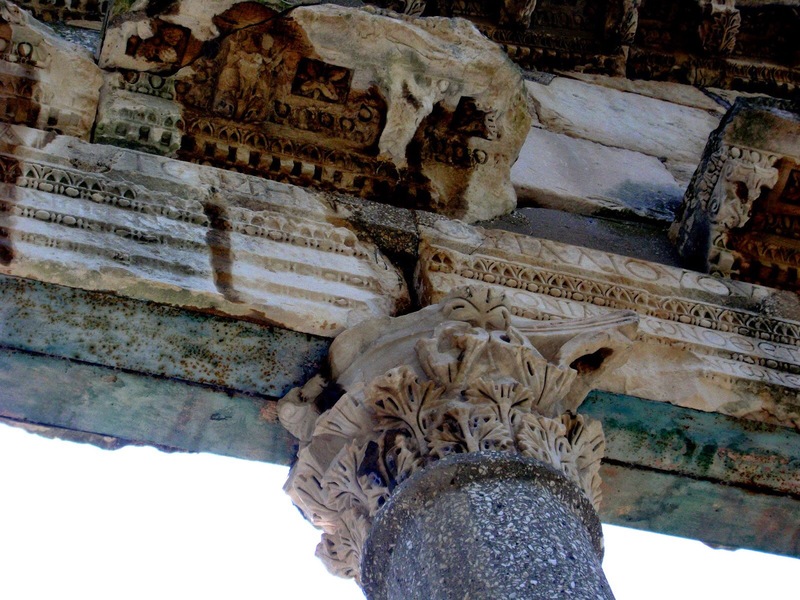 The handling of the walls is simple, but the external appearance is emphasized by the colonnade along the exonarthex which is crowned by capitals with a diversity of sculptural decorations (sirens, animals, and monsters), distinctly Romanesque in character and reminiscent to Romano gothic art which flourished in Ragusa and Tivar during the thirteenth to fourteenth centuries. From the painting program of the katholikon may be distinguished the fresco depicting several members of the Byzantine imperial family of the Palaiologi on the east wall of the exonarthex and the Deposition or the Archangel Gabriel portrait in the eastern part of the nave of the church. The refectory stands in the western part of the monastery with a Nord – South orientation. It is triconch architecture, with its eastern, southern and western walls terminating with apses. The southern apse is rectangle and amplified during the restoration works of the year 1962, while the others trilateral. The interior of the building was decorated with fresco painting, very interesting in point of view of the organization the iconographic cycle and its artistic and technical qualities. It belongs to the roman – byzantine group of paintings, from which very few examples survive. The partially preserved cycle of frescoes reveals scenes like the Wedding at Cana, Washing of the Feet, Deisis, Prophet Elijah in the Cave, figures of apostles and prophets and scenes from the Cycle of Miracles of Christ. The realistic rendering of the landscapes is reminiscent of the painting of the Italian Renaissance. However, the execution may be considered a work of an anonymous artist native to the general area. The mingling of eastern and western building traditions in the Monastery of St. Mary is not an uncommon phenomenon in the Balkan area, a long-disputed border between the eastern and western spheres of influence. This rivalry between the two spheres, for all its negative side effects on the political and religious life in this area, has also colored the Balkan cultures with their unique individualism.